Access to online banking has made transferring money between bank accounts easier than it ever has been. There are several ways to move money from one bank to another electronically; all have their pros and cons, but they get the job done. If both accounts are yours, a bank-to-bank transfer is a good option. You can set up the transfer with the sending or receiving bank, and the funds arrive at the destination after two or three business days. Many banks allow you to make free transfers between connected accounts, but it's a good idea to check with both banks just to be safe. No transfer can be completed until the two accounts are linked. This process can take about a week, so be sure to establish the link before you need to send money. Log in to the account you’ll send from and look for an option to “add an account,” “add external accounts,” or “link accounts” in the customer service area. Provide the other bank’s routing number and your account number at that bank. If you don’t have that information, get those numbers either on a check, from that account's online banking account, or from your bank. After submitting that information, you need to verify that you own the external account. You typically can do this by providing a username and password for that account or by confirming small “test” transfers between the two banks. This method is easiest if both bank accounts are in your name. To transfer funds to somebody else, you’ll probably need to use a third-party provider such as PayPal or a wire transfer. This is not an exhaustive list as many local credit unions and smaller banks also offer similar services for free. Check with local institutions for details. Even banks that charge fees, such as TD Bank and Bank of America, provide free transfers to other account holders. If your bank doesn’t offer bank-to-bank transfers or you need to send money to somebody else, there are several person-to-person (P2P) payment tools available. To get set up, you’ll link your bank account to the app or service using your checking account and routing numbers the same way you link accounts from separate banks. For example, if using PayPal, the funds you send will be taken from your bank account by PayPal and moved to the recipient's PayPal account. The recipient then can use the money via PayPal or transfer it to a bank account. PayPal is perhaps the most popular service, and it's often the easiest to use since its popularity means both senders and recipients are likely to have accounts. There is no charge to transfer money to friends and family, though instant transfers cost 1 percent of the amount being transferred, up to $10. Otherwise, the transfer can take a day or longer depending on your bank and other account preferences. Most banks offer free or inexpensive P2P transfers through Zelle, Popmoney or similar vendors. These services are usually added to your checking account automatically. Look for "personal payments" or something similar while you're logged in to your account. Venmo is a popular tool owned by and similar to PayPal. Transfers are free unless the source of the funds comes from a credit card. Then, there is a 3 percent fee. Google Pay works much the same way as other services and can be synced with Gmail. Not in any rush to move the money? Sometimes technology is more trouble than it’s worth. Maybe you’ve got a few bucks sitting around in an old bank account, and you just want to clean it up and get it over to your new bank. It’s hardly worth the effort to punch in all the routing and account numbers and sign up for a new app just for that. If you’ve got checks, writing one to yourself is a simple solution. Just put your own name down as the payee, and deposit the check into your new account. 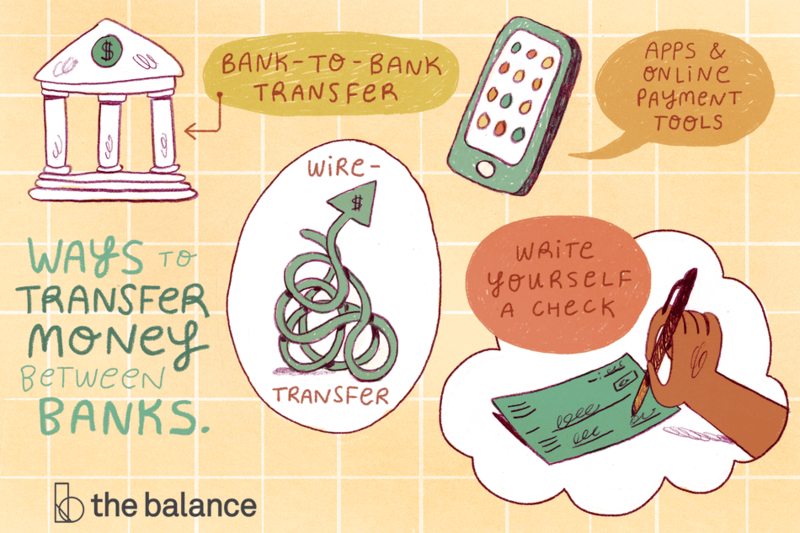 You can take care of the whole thing without leaving the house if you deposit the check with your mobile device. If you don’t have a check, just ask the bank to print one for you. Even if you’re out of state, there’s rarely any difficulty getting a check made payable to you (the account owner) and mailed to your home address on file with the bank. Alternatively, you can use your bank’s online bill payment service to make a payment to yourself. The process might be especially easy if you use a credit union that’s part of the Shared Branching network: You can just walk into any branch in the country and request the check.